The String Doll Gang is just one of the full-of-character offerings of Fair Trade company Kamibashi — the collaboration of Asian artists and a North Carolina couple who were formerly teachers in Japan. They find quirky handmade creations such as The String Doll Gang and partner with the artists to sell their wares online. With more than 100 different personalities to choose from (a word of warning: some are more child-appropriate than others), kids will love these mini 2 to 3-inch toys that make for fun little surprises when traveling, or anytime! The String Doll Gang is just one of the full-of-character offerings of Fair Trade company Kamibashi -- the collaboration of Asian artists and a North Carolina couple who were formerly teachers in Japan. 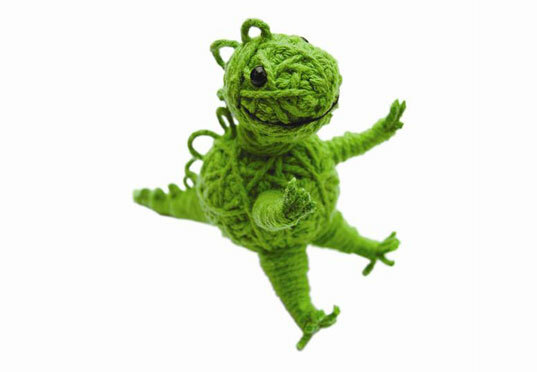 They find quirky handmade creations such as The String Doll Gang and partner with the artists to sell their wares online. With more than 100 different personalities to choose from (a word of warning: some are more child-appropriate than others), kids will love these mini 2 to 3-inch toys that make for fun little surprises when traveling, or anytime!